Editor’s Note: Lovina Eicher is busy with preparations for her daughter Susan’s wedding. Guest columnist Ruth Boss, an “English” friend of Lovina’s, provides a ringside seat for the big August 5 wedding. Wedding preparations have been in full swing all week for Susan and Mose’s wedding this Friday. 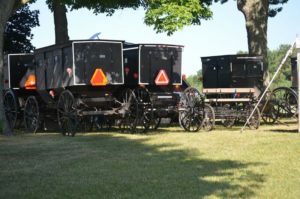 Last Saturday the wedding wagons were delivered: a cook wagon, a refrigerated wagon, and a supply wagon holding all the serving dishes, plates and silverware. 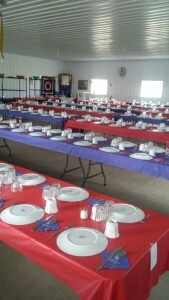 Family members and friends pitched in to get the tables set up in the shed, or pole barn. Susan has chosen green for her wedding color, so cooks, table waiters, attendants, coffee servers, family members and anyone else helping will be wearing hunter green, sage, mint, or grass green shades. Friends, neighbors and family came by buggy to help during the days before Susan and Mose’s wedding. The cooks began arriving very early Wednesday morning. By 7 a.m. the cook wagon was filled with women making cinnamon pudding. It is baked and will be cut into small pieces and layered with whipped topping and topped with nuts. It can be served right out of the pan as a cake. Other cooks started making the angel food cakes, all made from scratch. Some of the egg whites that Lovina had frozen ahead of time for the wedding weren’t stiffening up, so someone was sent to Susan’s (who is a baker) house down the street to get the jar she had in her refrigerator. Next came baking pecan pies. By now the wedding wagon was very warm, with seven ovens and cooktops going! 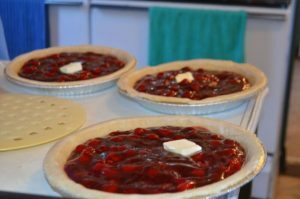 Other pie shells were baked to be used to make fresh strawberry pie, which is Susan’s favorite. Other cooks cleaned, chopped and bagged celery, carrots and onions to be used in the dressing. Some cooked, deboned and shredded chicken to be used in the stuffing and noodles. Women helping Lovina prepare for the wedding made many classic, lattice-topped cherry pies. At mid-morning, all the women stopped for a coffee break with cookies and bars that the women had brought to share. Family members and friends who don’t live close by used this opportunity to catch up on news from back home. Neighbors chatted about their families, new recipes and local news. Some of the cooks are young mothers and brought their young children with them. 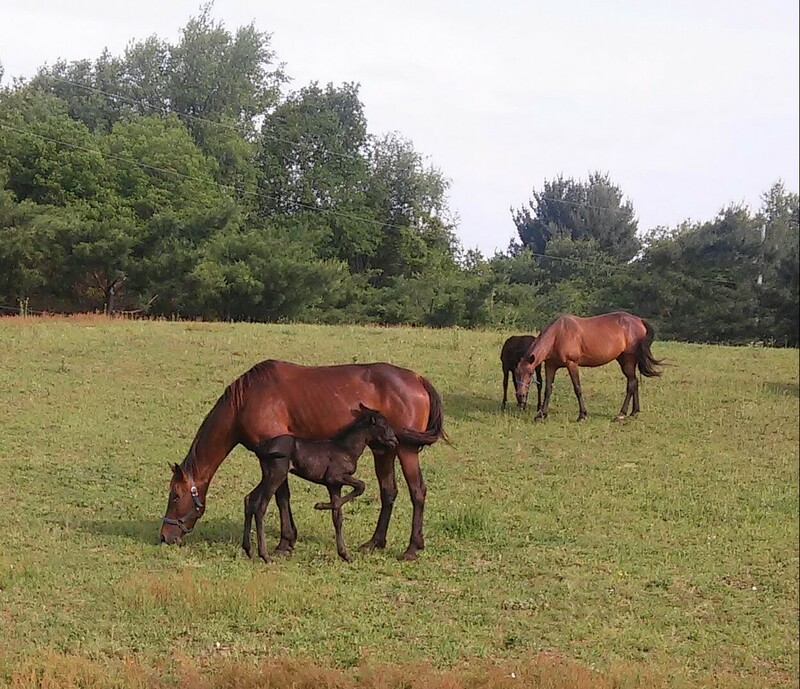 The older children seem to enjoy watching over the babies as their moms work. 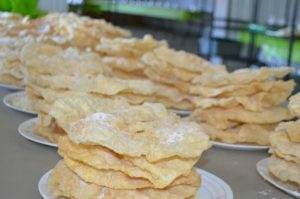 Next, Lovina’s sisters began the time-consuming job of making “Nothings,” which are a traditional wedding treat from their home town of Berne, Indiana. Nothings are made from special dough that is rolled thin and then deep-fat fried. This is very hard work, and it took the sisters a few hours to get all the dough rolled. 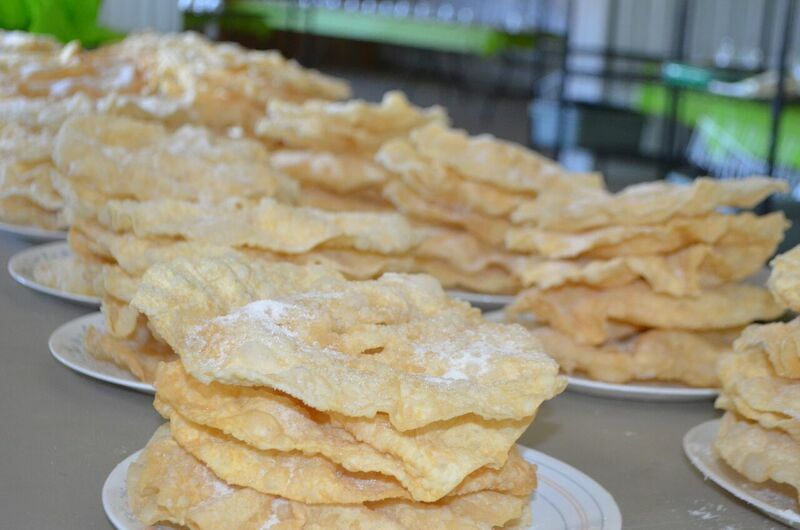 Once the Nothings are puffy, they are taken out of the oil, drained and topped with sugar. The stacks of Nothings were covered and will be passed at the meal as a special treat. 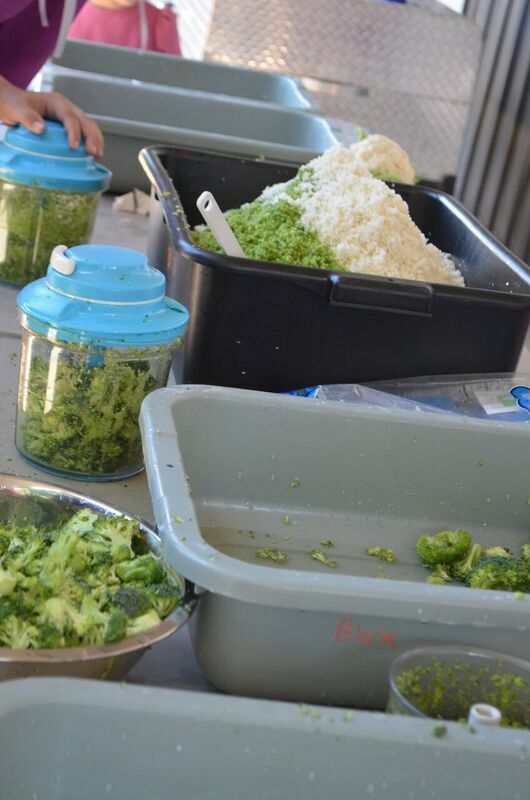 At noon, the helpers enjoyed a delicious meal of casseroles, salads and desserts, all provided by the cooks. All together there are 52 cooks helping with the wedding. They will make homemade bread, chop broccoli and cauliflower for salad, clean strawberries and finish up whatever else needs to be done. All the cooks will assemble the morning of the wedding to peel and cook potatoes, assemble hot foods to cook, and prepare salads. They will ready dishes to begin the first serving at about noon, after the marriage ceremony, which will start about 9 a.m. This is a big undertaking! What strikes me as I observe the work being done is that there is no arguing or complaining from anyone. Everyone is excited and willing to work. There is laughter and horseplay. 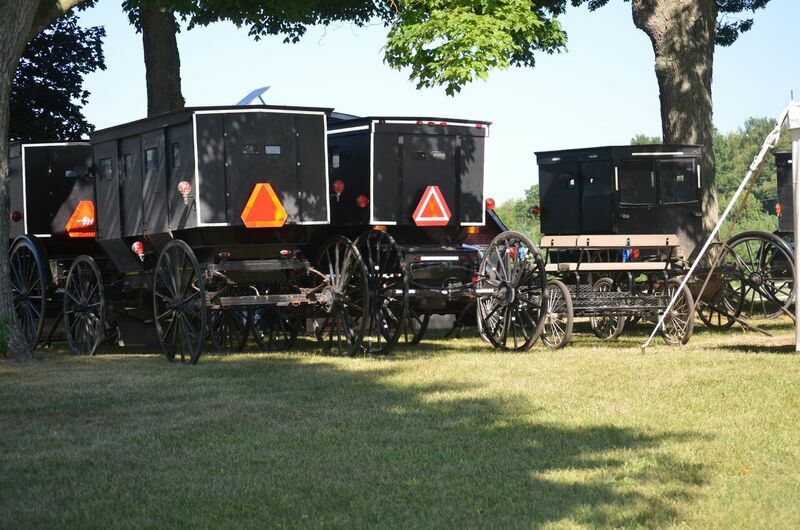 The Amish focus a lot on family togetherness and don’t have many of the distractions that we English people have. Lovina’s family is close-knit and loving. They have hard times and disappointments like everyone else, but their faith in God and close family sustains them through those times. 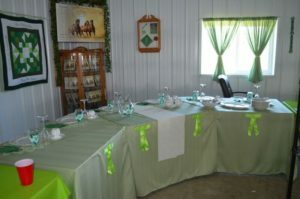 The table, or “eck corner,” for the wedding party is set days in advance, as the family finishes final details. This week, as the Eicher family gets ready for Mose and Susan’s big day, will be filled with hard work, amazing food, good conversation and lots of laughter. 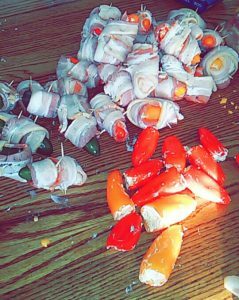 Here is a recipe for a small quantity of Amish Wedding Nothings. 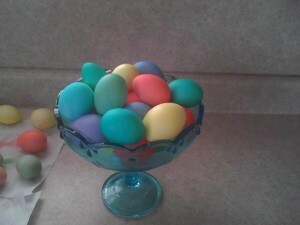 Beat egg and stir in cream, salt, and enough flour to make elastic dough. Make 6 or 7 balls out of the dough. Roll out each ball of dough very flat and thin, about 1/16-inch think. Cut about six 3-inch slits in the middle of the circles. Heat shortening in a large kettle over high heat (or use an electric frying pan with a temperature control). When the shortening is 365 degrees, test a piece of dough to see if it sizzles; put a rolled-out Nothing into the kettle or fry pan. Fry one at a time, unless you have a huge kettle. 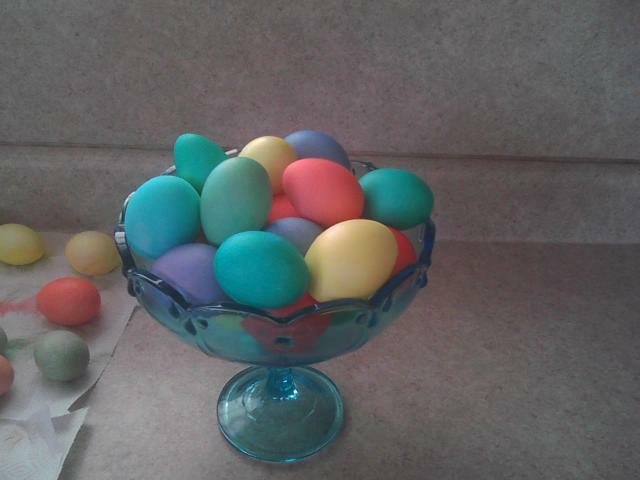 Turn each piece over with forks or large spatula once it turns golden on the bottom. Remove from oil and place on plate covered with paper towels to drain. Sprinkle powdered sugar on top while warm. Stack the Nothings on top of each other to serve. Makes 6-7. We are halfway through June! It is a lovely but warm evening. Everyone has retired for the night except daughter Verena, who is reading on the porch swing, and me. I am also on the porch, writing at the patio table. I’m enjoying the peacefulness. God has created such a wonderful world, and people do not appreciate it enough. How often we get so caught up in the busyness of life that we don’t even notice the beauty of it all. I’m watching two hummingbirds that are buzzing by the feeder. They are such tiny birds but can make quite a lot of racket! 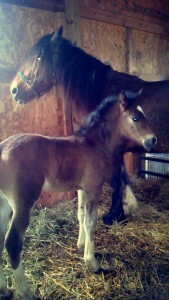 Today was a warm day to travel to town with the buggy and our horse, Mighty. Daughter Lovina, 12, and son Kevin, 10, had appointments at the eye doctor. Lovina needs glasses now, but Kevin’s eyes test very well yet. I was able to pick up my new glasses as well. 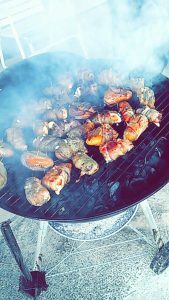 My husband, Joe, made supper on the charcoal grill tonight to keep the heat out of the house. I appreciate that, especially after coming home from town late in the day. Verena and Loretta had cleaned out some more cabinets while I was gone. Yesterday, June 14, was daughter Elizabeth’s twenty-second birthday. How can it be that our firstborn is already that old? Lovina has been spending Monday night and Tuesday with Elizabeth. Timothy and Elizabeth brought her home last night, and I made one of Elizabeth’s favorite meals, since it was her birthday. On the menu: mashed potatoes, beef gravy, macaroni and cheese, corn, lettuce salad, sliced cheese and strawberries and ice cream. Our whole family went to Timothy and Elizabeth’s house on Saturday in honor of Elizabeth’s birthday. We all spent the night there and stayed until Sunday evening. It was an in-between Sunday, and so we didn’t have a church service that morning. We had such a good time as a family—making memories. Timothy had the grill going to make supper outside. We all gathered around the fire after supper and made s’mores. 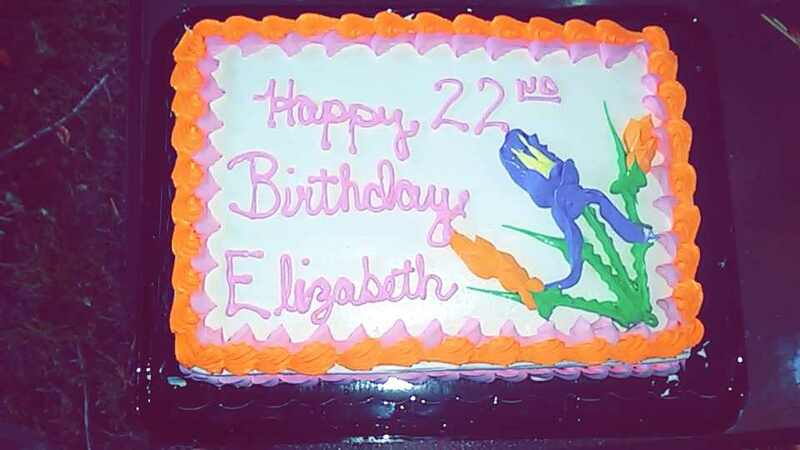 We took a cake for Elizabeth, but I forgot the candles at home. I think Elizabeth was glad I did! She thinks she’s too old for that. On Sunday morning, Elizabeth put in the oven a big breakfast casserole, which she had prepared the day before. She also had biscuits to go with it. Also on the menu were sliced cheese, tomatoes, hot peppers, watermelon, cake, strawberries, rolls, brownies, grape and orange and rhubarb juices, coffee and chocolate milk. After dishes were washed, we all went for a wagon ride in Timothy and Elizabeth’s big two-seated wagon. We put some chairs on to make room for all of us. We went to the lake and enjoyed snacks under the shelter there. Some went swimming in the lake. They have a nice beach area. Then we headed back to Timothy and Elizabeth’s house. The sun was out, but there was a good breeze blowing so the ride was pleasant. We all enjoyed pizza before we headed home. The day went so fast, and I enjoyed it so much. How different to have someone else doing most of the cooking! Elizabeth does a good job. She has been blessed with a good husband. Seeing that our daughter is happily married means so much to us as parents. Twenty-one years ago today, sister Emma and Jacob were united in marriage. Happy anniversary to them! 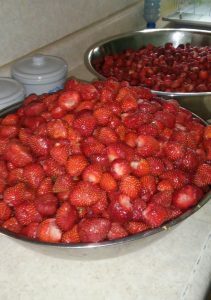 We cleaned 32 quarts of strawberries that we will make into jam tomorrow. Some of it will be for Mose and Susan’s wedding in August, and the rest will be for the freezer so we have some for another year. Strawberry jam is our favorite jam. Combine flour and brown sugar; cut in butter until crumbly. Stir in pecans. Press into an ungreased 9 x 9-inch baking pan. Bake at 350 degrees for 14–16 minutes, or until lightly browned. Cool. Crumble the baked pecan mixture. Set aside ½ cup for topping. Sprinkle remaining mixture back into the baking pan. 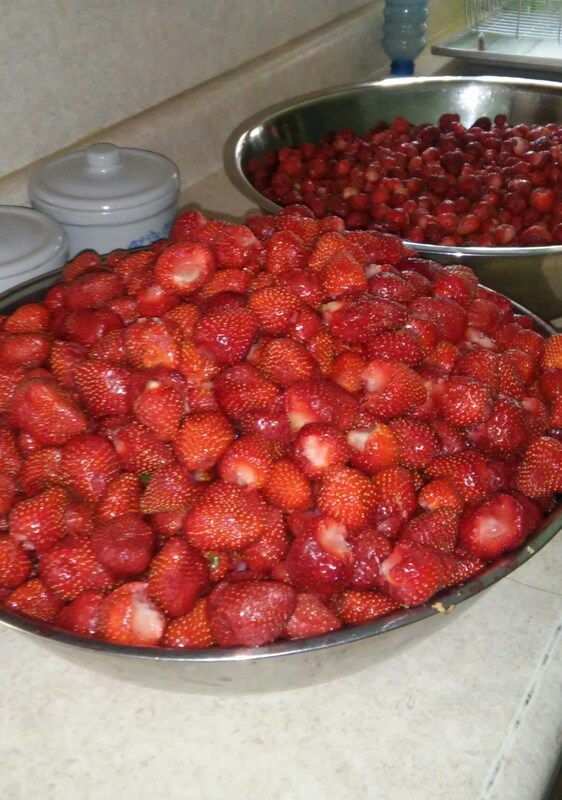 In large bowl, beat strawberries, sugar and lemon juice until blended. Fold in whipped cream. Spread evenly onto dish. Sprinkle with reserved pecan mixture. Cover. Freeze for eight hours or overnight. It is 7 a.m. Joseph, 13, Lovina, 11, and Kevin, 10, just left for school. It sounds very windy outside, but the temperature isn’t that cold, 58 degrees. Son Benjamin, 16, is outside doing the morning chores. He doesn’t have work today. Mose is putting a new motor in his saw if I understood right. The motor came from Wisconsin so it’s all taking time to get repaired. Benjamin has been enjoying hunting on some days. Opening day for shotgun season was on Sunday. Mose bought daughter Susan, 19, a gun and they went hunting on Monday. Susan didn’t get anything. This week I have been sewing work pants for son Benjamin. I want to cut out some dress pants for him yet. On Sunday my sisters Verena and Susan, our daughter Elizabeth and her husband Timothy, and Jacob and Emma’s three sons Jacob Jr., Benjamin, and Steven were here for dinner. Jacob and Emma went to church in a neighboring district and came over in the afternoon. The family enjoyed the game Aggravation which can get pretty loud when the game is almost over. Jacob Jr. makes the Aggravation boards. On one side four people can play and on the other side six people can play. The board is big and fits a card table. Jacob Jr. had his sixteenth birthday on November 17. He has muscular dystrophy. He enjoys making things from wood. It helps give him an income since he doesn’t always have work. Sunday evening Verena and Benjamin took Jacob Jr. along to the youth singing and supper. Daughters Verena and Loretta have been cleaning windows here the last few days. It’s nice to have them all cleaned before the snow starts flying. We have a lot of windows in our house. Our church Sunday has changed now as our church divided into two districts. We had around forty families and now only have about twenty families in our district. All together we have around sixty adults and over fifty children in our district. It looks like church services will be held here at our place in January. After the holidays we will need to get busy cleaning. We also need to butcher beef and pork sometime. I would be glad if we could get that done before we do the cleaning, but we will see. Last week my husband Joe was home every day except Monday. He was on an antibiotic for ear infection from the doctor at work. His ear kept getting worse so he went to the local walk-in clinic when our family doctor couldn’t see him. The clinic doctor gave him another antibiotic and medicated ear drops. His temperature was around 102 to 103 degrees most of the week. He felt a little better by this past Monday and went back to work again. But then he came home that evening with his ear throbbing again. Finally our family doctor was able to work him in that evening. He gave Joe a five-day antibiotic and said he has fluid behind the ears from a sinus infection. We are hoping the five-day antibiotic will cure it as he’s been pretty miserable with this pain. It makes his whole head hurt. It he doesn’t get relief from this, the doctor wants him to come back. This has interrupted Joe’s deer hunting too. I will be glad once he’s free from all the pain that ear has given him. 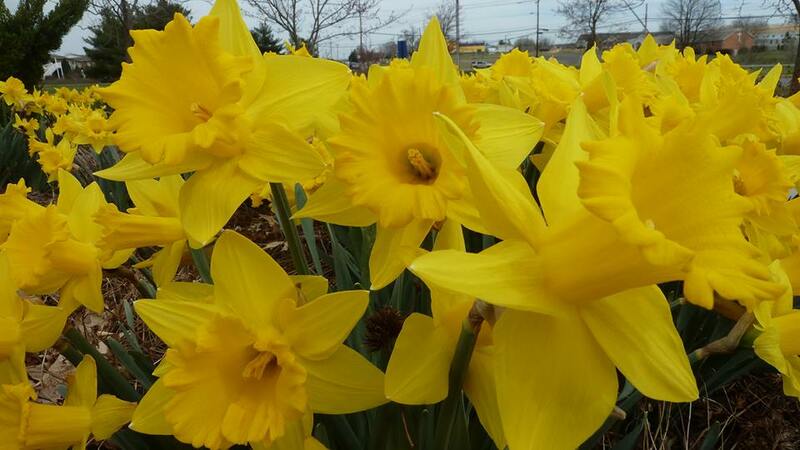 We are praying for a complete recovery of Suzanne (a friend of Verena and Loretta). She was in a bad accident in South Africa while on a mission trip from her church. She is in critical condition and two of her friends died from the accident. May God guide the families through this tragic time! Our sympathy to the families of the deceased. Suzanne is in a hospital in South Africa. God’s blessings to all. Here is a different kind of dessert using pumpkin. Mix Oreo crumbs and melted butter. Press into a 9×13 inch baking pan. Beat cream cheese and sugar until light and fluffy. Slowly add in heavy cream and beat until stiff peaks form. In another bowl beat milk, pudding mix, pumpkin, and spice until well mixed and thick. 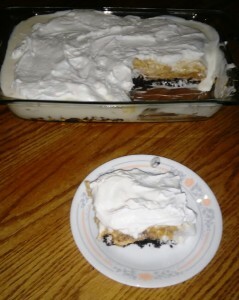 Layer cream cheese mixture and then pumpkin mixture on Oreo crust. Top with whipped topping. Serve cold. We are almost halfway through November. So far we are having beautiful weather for November. My husband Joe started our coal stove on Saturday for the first time this season. It seemed later than usual to start it. The house is nice and cozy now. Saturday we were at Jacob and Emma’s. Joe and our sons Benjamin and Joseph helped put siding on the new addition they are adding to the house. Things are falling into place. They will be so glad for more space. The windows and doors are in and some of the drywall is hung in the upstairs bedrooms. Saturday evening Mose (Susan’s special friend) grilled chicken and banana poppers while we prepared more food in the house. Daughter Elizabeth and Timothy joined us for supper. It was so enjoyable to have the whole family together. After we ate we sat in the living room and visited and sang some songs. Of course Izzy and Crystal (the Yorkies) were the center of attention. They love the attention they get here. Son Benjamin, 16, and daughter Verena, 17, left to go to the community building where the youth gather on Saturday evenings to play basketball, volleyball, etc., and enjoy snacks. Two or more sets of parents usually go to chaperone and take the snacks. The building is usually closed at midnight. Verena and Benjamin didn’t take the heater in the buggy so they had a cold ride home. It is still warmer with a covered buggy than the open buggy that I was raised with. We had some awful cold rides and the umbrella was a big help to block the wind. I feel spoiled now when we drive in the covered buggies. Some have heaters in them which makes for a warm ride to town and back. Friday evening Mose helped us make our first cider with a fruit press. He brought us apples from his parents’ apple trees. We don’t have anything to chop up that many apples so we used our meat grinder and it worked real well. The cider tastes really good. We are enjoying popcorn and cider on some evenings. We want to make more and think we have a better idea of what we are doing now. 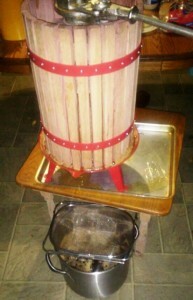 It is surprising how many apples it takes to press one gallon of cider. But we enjoy working together as a family on projects like that. We are excited to hear the news of the birth of a baby girl, LaRose. LaRose was born to niece Elizabeth and Samuel on November 10. This makes my sister Liz and Levi grandparents for the first time. We wish them all well. I’m sure they are all excited for the new arrival. I had several requests for the buttermilk brownies recipe so I’ll share it this week. Preheat oven to 400 degrees. Sift the sugar, flour, salt, and cocoa together in a bowl. In a saucepan, bring the water, butter, and oil to a boil. Pour over the sugar mixture and beat until creamy. Add the buttermilk, baking soda, eggs, and vanilla. Stir thoroughly. The batter will be thin and soupy. 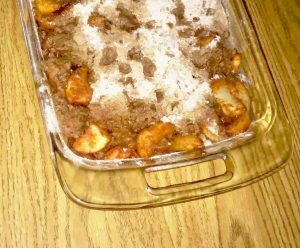 Pour into a greased 9×13 inch baking pan. Bake for 30 minutes until sides begin to pull away from the pan and a toothpick inserted in the center comes out clean. Makes about 15 (3-inch) brownies. It was hard to believe this day was finally here after so much preparation to get ready for it! 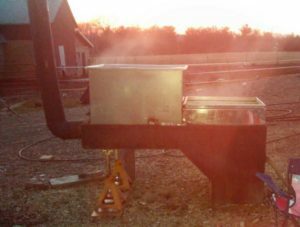 Joe’s cousin Samuel started grilling the 350 pounds of chicken at 4:00 a.m on Friday. Around 6:30 a.m. the cooks started arriving to get the food prepared. Wedding services were held at our neighbors’, Joas and Susan’s. 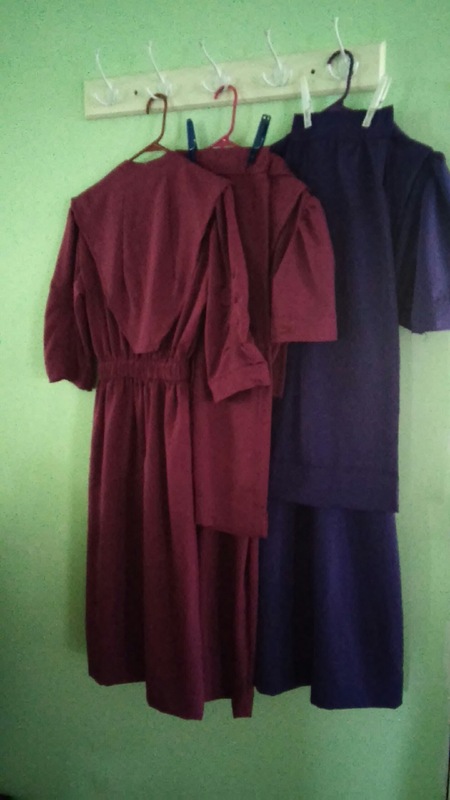 Timothy, Elizabeth and their four witnesses—Mose, Susan, Ernie and Martha (Tim’s sister and her husband)—left to go to the neighbors soon after 7:00 a.m.
Verena, Loretta and Lovina wore these dresses for Elizabeth’s wedding. Elizabeth likes the color burgundy and Timothy likes purple, so the wedding colors were those two colors. Elizabeth got married in a burgundy-colored dress with a white cape and apron. The grooms always wear a black suit and white shirt, as do the witnesses. Susan and Martha wore purple dresses with white cape and aprons. Family members wore a shade of rose, and the table waiter girls wore another shade of raspberry-colored material. Timothy’s mother and I wore dresses of a dark plum color, and some of the helpers wore purple. The cooks all wore dark gray. The men and boys all wore black pants and vests with white shirts. Timothy’s nephews wore rose-colored shirts and sharkskin-gray pants. His nieces wore rose-colored dresses. An Amish couple says these vows to each other on their wedding day. 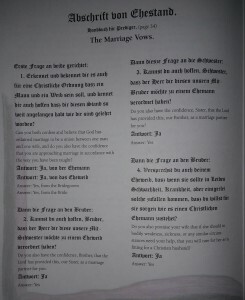 Here they appear in German and English. Around 11:30 a.m., toward the end of the service, Bishop Leroy asked Timothy and Elizabeth all the marriage vows, which they responded to with yes. There are six questions that are asked. Then everyone is asked to stand for a prayer for the couple. After the prayer the bishop takes the hand of the bride, places it in the hand of the bridegroom and pronounces them man and wife. After the service ended around noon, everyone came to our house for the noon meal. We estimated that there were more than 500 people here for the noon meal. Our menu consisted of barbecued chicken, mashed potatoes, gravy, noodles, dressing, corn, cheese, lettuce salad, homemade bread, butter, strawberry jam, angel food cake (with frosting and Danish dessert topping), dirt pudding, mixed fruit, and cherry, pecan, and peanut butter pies. We made 25 of each kind of pie. Candy bars were passed around after the meal. The same menu was served at night, but smoked sausage and ice cream were added to the meal. 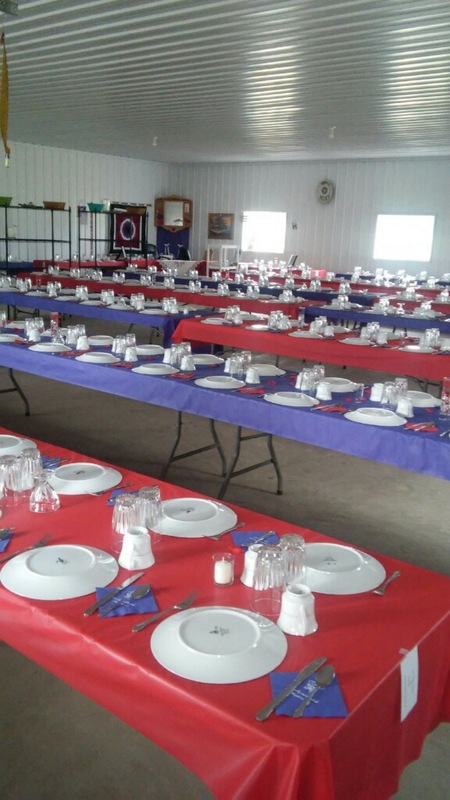 We served around 575 for supper. The Eicher family served more than 1,000 meals on the day of Elizabeth and Timothy’s wedding. Timothy and Elizabeth opened their gifts in the afternoon. 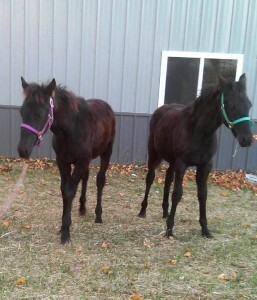 They have a lot of nice gifts to add to their new home. The gifts are usually household items such as kitchen items, towels and bedding, and some give things like tools and shovels for the groom. Money is given by some who aren’t sure what to give, which is also nice because the bride and groom can go buy what they didn’t get. Also, a thank you from Timothy and Elizabeth to all the readers who so kindly sent cards and gifts. They were greatly appreciated! God bless! God’s blessings to Timothy, Elizabeth and all you readers. Mix together all ingredients except pecans. Pour mixture into a 9-inch unbaked crust. Sprinkle pecans on top. Bake at 350° for 10 minutes, then reduce heat to 300° and bake until pie is set. Makes two 9-inch pies. It is a hot and humid Sunday afternoon. My husband, Joe, and I and our four youngest children are the only ones home this afternoon. Everyone is taking naps. It would be nice to take one too, but I need to get another column written before next week. Church services were held at our neighbors Joas and Susan’s house. The next services will be here in two weeks. 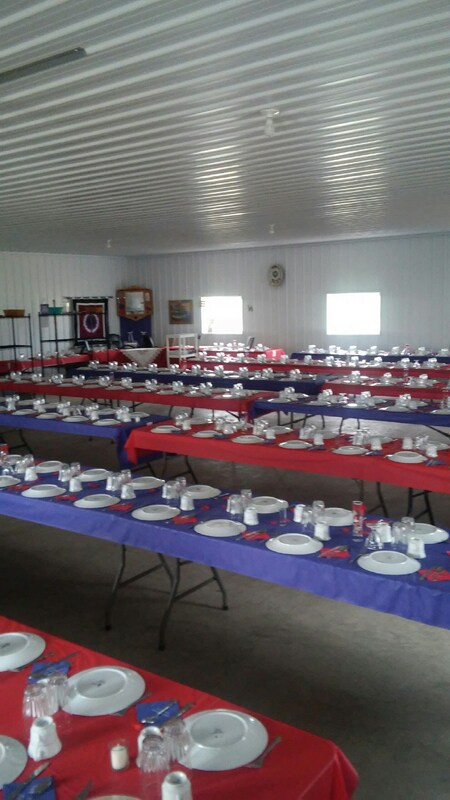 Joas and Susan will also host the wedding services for Timothy and daughter Elizabeth in their nice new pole barn on Friday. The receptions will be here. 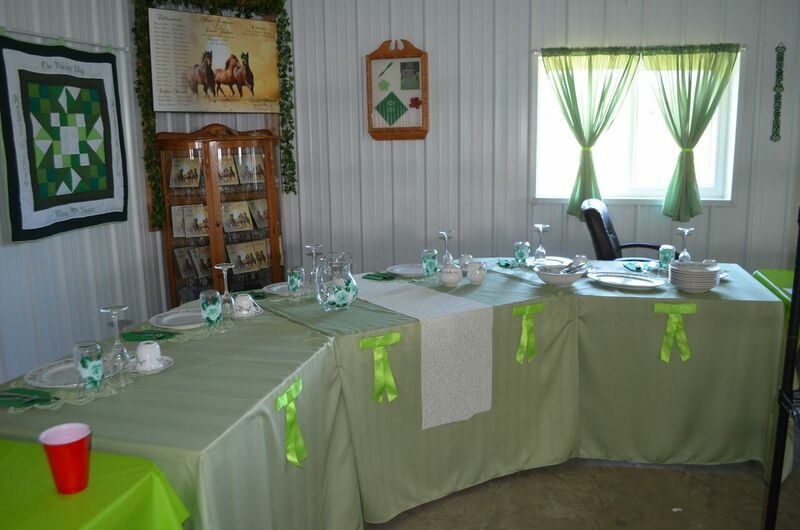 On the day of the wedding, we serve a meal after the services and marriage, which are usually all done by noon. 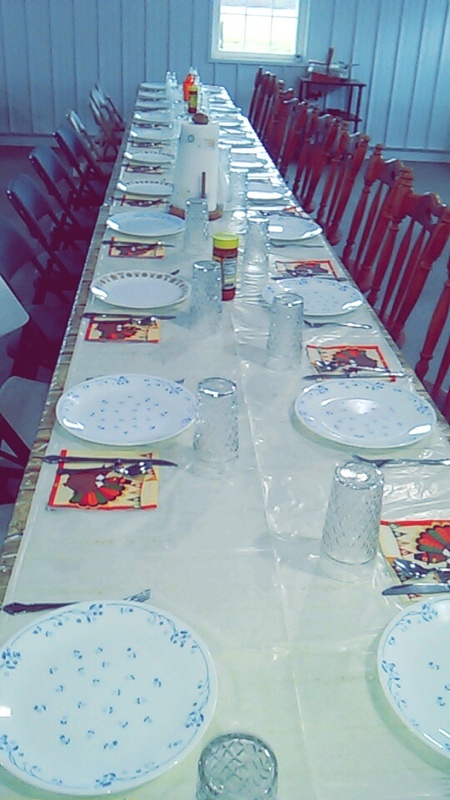 Then we serve a 5:00 p.m. supper for guests and a 7:00 p.m. supper for the youth and family. The bride and groom usually open their wedding gifts in the afternoon. The inside of the wedding wagon, a portable kitchen that Lovina and her family are using to prepare the food for hundreds of wedding guests. We are renting a wedding wagon, which comes with seven stoves and two sinks, plus all the pots, pans and dishes you need for the wedding. 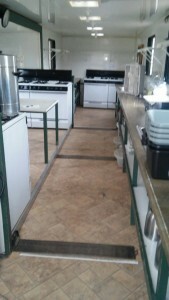 It also has a big cooler/freezer to put all the food in after it has been prepared. 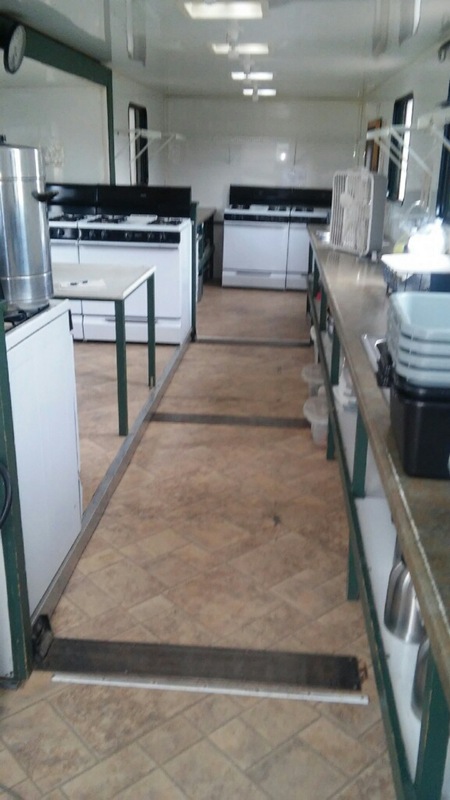 An 8×16-foot trailer comes with it, carrying all the tables, shelves and dishes. Yesterday we had a lot of help to get the tables set for the wedding. There are enough place settings for 350. 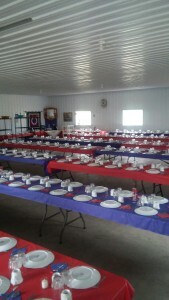 We have enough room in the new pole barn to seat 350 people at one time plus the bride, groom and their four witnesses. The wedding wagon, cooler, and trailer with dishes and tables have to be ready to leave here at 7:00 a.m. Saturday morning. It will go to another place for another wedding. The tables are set for the big wedding day of Elizabeth, Lovina and Joe’s oldest daughter, and Timothy. My thoughts and prayers are with my firstborn this afternoon as I think of her taking this big step in life. She will have a lot of changes, but I have no doubt in my mind that they will be good ones. It is just a mother’s nature to worry for her children, but there needs to be a time to let them experience life without the presence of their parents. Elizabeth has been a great daughter and never caused us any trouble. She was always obedient to us, which means so much to parents. My advice to her is to always start her day with her husband in prayer together and to end it with prayer together. What a great way to start and end your day with God being the guide. Every marriage has its ups and downs, but if you have love and respect for each other, things can always be healed. 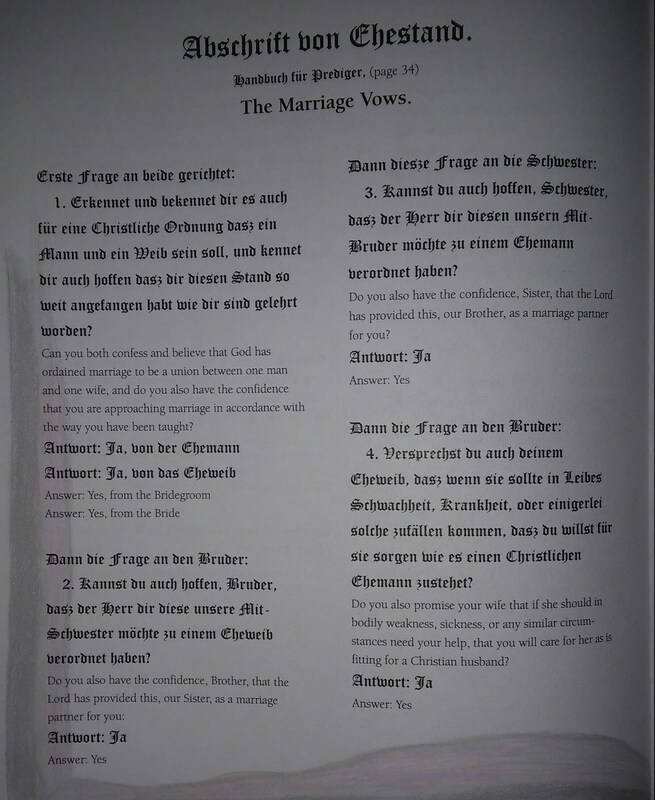 Marriage vows should be taken very seriously. Elizabeth, I pray that you and Timothy will always remain in love as much as you are now. Joe and I were fortunate to have parents who encouraged us and let us make decisions on our own. We asked for a lot of advice, but parents can only give so much advice. It takes husband and wife alone to work things out together, with God as their guide. Elizabeth and Timothy, may you have a long and happy married life together. May God grant you both good health and a family to care for. I hope and pray your wedding day will be a day you want to remember. My love to both of you. Now we will gain a son, not lose a daughter! God bless! 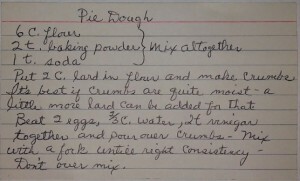 Here’s Lovina’s pie crust recipe from her card file. 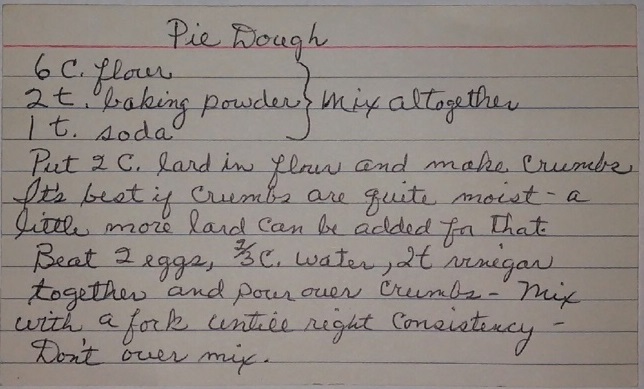 This week I’ll share Timothy’s mother’s pie dough recipe, which we will use to make all the pies for the wedding. I’m not sure yet, but I think we will make 75–80 pies for that day. 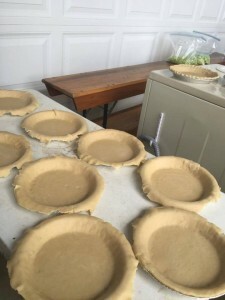 Pie crusts wait for filling as preparations continue for Elizabeth’s wedding. Mix together flour, baking powder and baking soda. Stir lard into flour mixture to make crumbs. It’s best if crumbs are quite moist; add a little more lard if necessary. Beat together eggs, water and vinegar and pour over crumbs. Mix with a fork until right consistency. Don’t overmix. Roll out and press into pie pans. Makes six single-crust or three double-crust pies.